Davis accuracy in a self-contained, easy- to-install system. Create a customized professional station with a wide range of options and sensors. 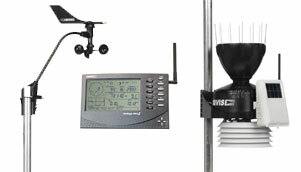 Solar-powered transmitter and detachable anemometer. Choose a cabled station for the most economical installation. Ideal for areas where lightning risk is minimal. Choose wireless for easiest installation, additional sensor options and reduced risk of lightning damage. Includes UV & solar radiation sensors. 24-hour fan aspiration model achieves maximum accuracy of temperature & humidity readings by circulating the air. Ideal for arid climates. 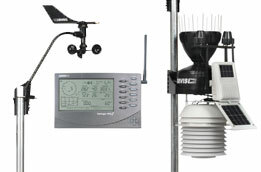 The Davis line of Vantage weather stations are built to provide a full weather system. To maximize your weather watching, a variety of additional sensors and stations are available to make your weather station even more comprehensive.